CLEVELAND, TN –The Cleveland City Schools Board of Education is having a dedication ceremony for Cleveland High School’s Junior Reserve Officer’s Training Corp’s room. The classroom is being named after Mayor Emeritus Tom Rowland, the city of Cleveland’s longest serving Mayor. The Classroom will be named the Colonel (Ret) Tom Rowland Air Force JROTC Classroom. The Cleveland City Schools Board of Education approved this bestowment earlier this year to honor Mayor Emeritus Rowland for his twenty-seven years of dedicated service to the city of Cleveland and his long-term commitment to Cleveland City Schools. The dedication ceremony will take place at 9:30 a.m. on Monday, November 12th at the Cleveland High School Raider Arena Lobby located at 850 Raider Drive, Cleveland, TN 37312. 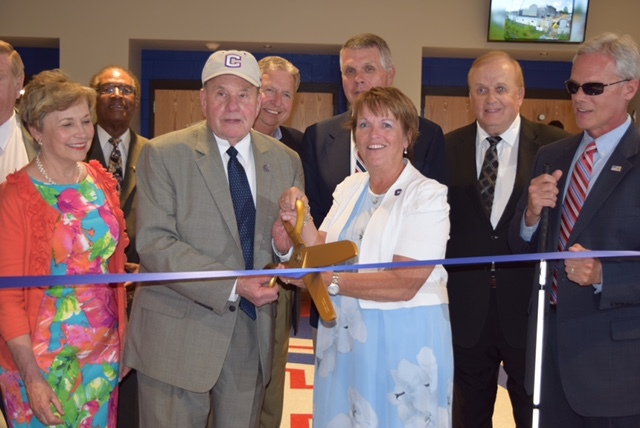 Pictured Front Row Left to Right: Board of Education Member Peggy Pesterfield, Mayor Emeritus Tom Rowland, Board of Education Chair Dawn Robinson and Board of Education Member Steve Morgan. ⇐Previous AIR FORCE JROTC DEDICATION CEREMONYNext⇒OFFICIAL RELEASE ON APPREHENSION OF BRADLEY CO. JUVENILE ESCAPEES.